In my final post on the 2013 Atlanta Symphony Show House (part I is here, part II here, part III here), I am going to share some vignettes of the house, taken with both my camera (which was on a strange setting – I couldn’t get it to act properly) and my iphone. 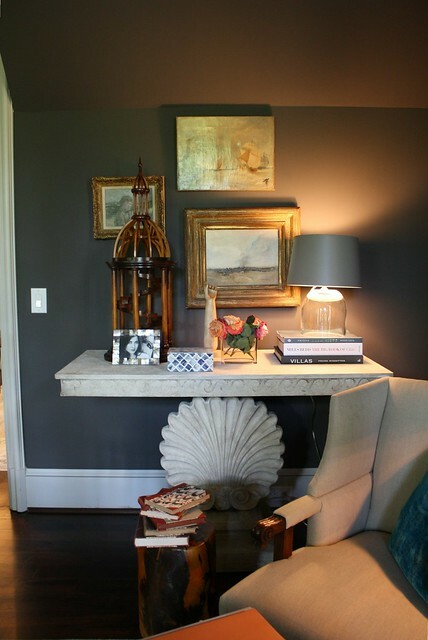 There were many different spaces in this showhouse, all decorated with their own unique flair and style. This post only scratches the surface of the incredible display of talent featured this year. Personally, I appreciate this as there is really no better way to display what is current and fresh than in a show house, particularly one with lovely architectural bones. 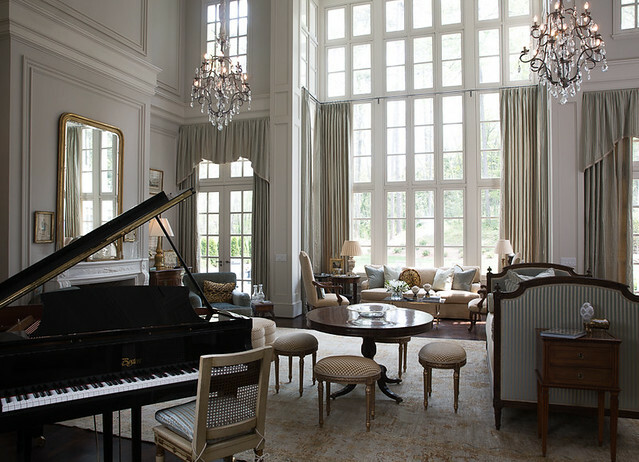 The living room, a grand two story space, was expertly designed by Patricia McLean Interiors. 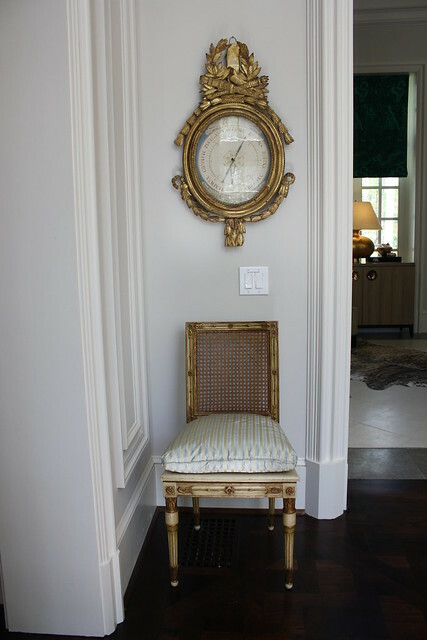 She often includes barometers in her designs – this one is charming. 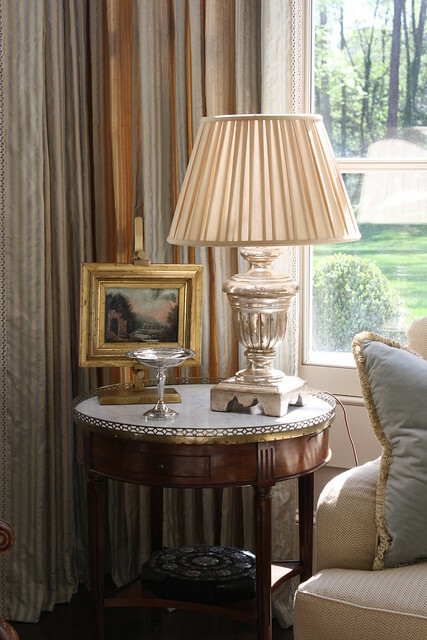 Another vignette from Patricia McLean’s room – beautiful, and I love how the light was streaming through the windows at the particular time that I took the photo. Here is a professional photo of the room, taken by Jeff Roffman. The room is so expansive it is impossible to get the whole thing in a photo (there is a beautiful section to the right). 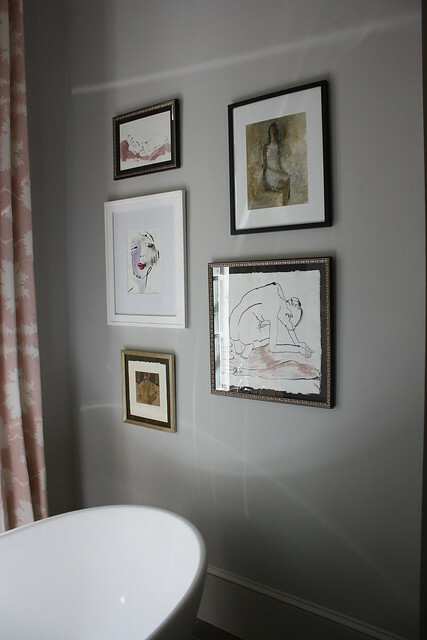 Charming art in the master bathroom, design by Janie Hirsch. 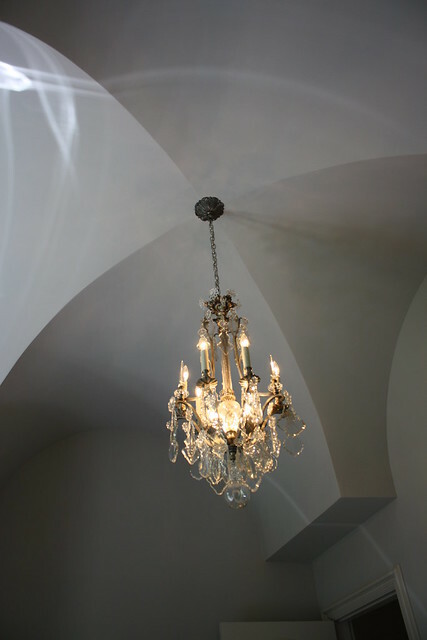 The master bathroom had a groin vault ceiling, and this delicate chandelier was the perfect touch. 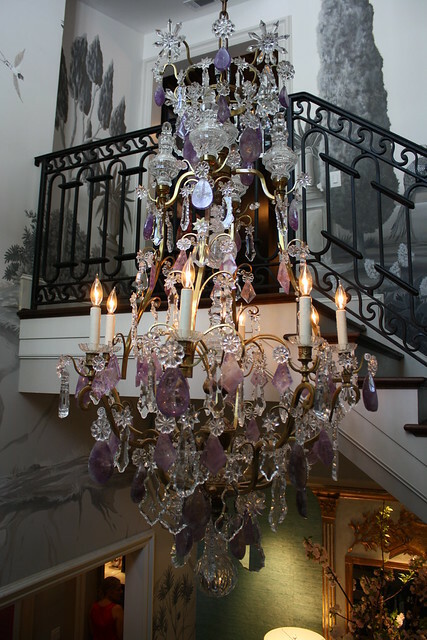 A close up view of that beautiful chandelier, in the family stair. This space was decorated by the Mercantile. Note the intricate pattern on the stair rail. 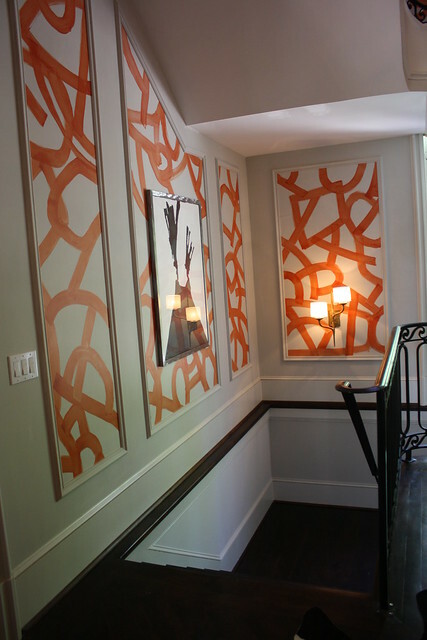 Glamorous hand painted panels in a vibrant shade of orange, a feature of the main stairwell. The inspiration was Kelly Wearsler’s foyer walls in her Beverly Hills home. Design by Bryan Alan Kirkland Designs. The upstairs hall, which partially overlooked the living room, was beautifully designed by Traci Rhoads Interiors. 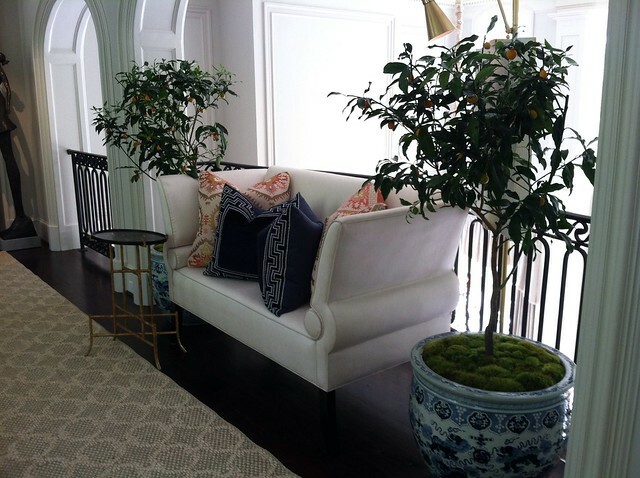 The live kumquat trees were flown in from California for this space, and are the perfect touch. 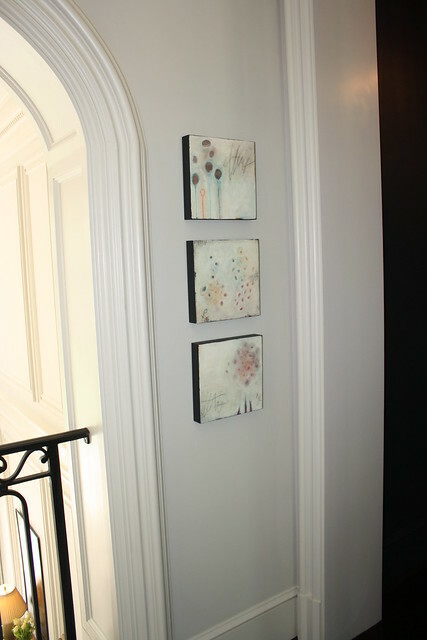 Three encaustic pieces, the perfect size and scale for this little wall in the upstairs hall. 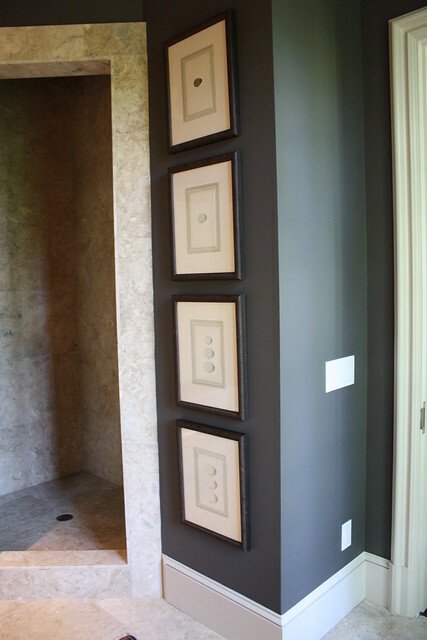 A series hung in a vertical display was a theme found in many of the rooms of the show house. This space is a secondary bathroom. Extremely well done gallery walls were found throughout the house. 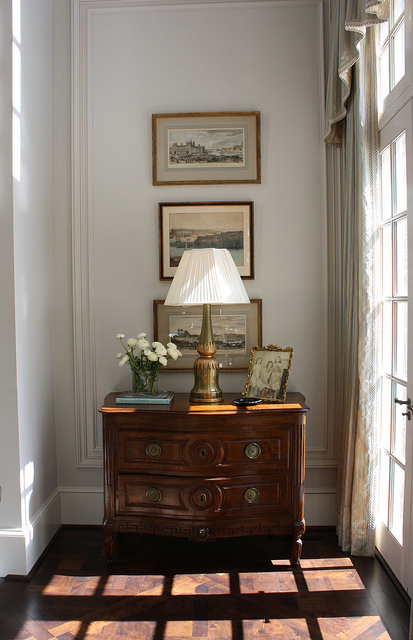 This vignette is so pleasing to the eye – it’s a work of art in and of itself. The balance of the paintings, accessories, books, and lamp look like a still life. (I’m not sure what room this was in – if you know, please comment). Another well done vignette, in the child’s room by Clay Snider Interiors. My camera wasn’t cooperating in this space (an interior bathroom), but I thought that the wall arrangement above the tub was very clever and worth including. Not sure who designed this space…. 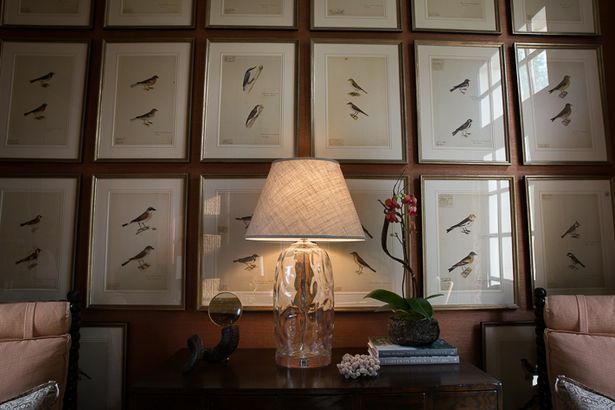 A room in the showhouse featured an entire wall of framed bird prints – an amazing sight. Design by Courtney Giles, image by Jeff Roffman. A view of the kitchen, photo credit Jeff Roffman. Design by Natalia Makarova, Karpaty Cabinets. The terrace level bonus room – created by IKEA, entirely with IKEA products! To the right is a kitchenette space, also done with all IKEA cabinets, counters, and appliances. I was very impressed! Have you had a chance to go to the Symphony Show House? Do you have a favorite room? If you haven’t visited, you still have time – the Show House is open through May 12. These posts have only shown a small glimpse of a fraction of the many spaces and designs, and I always notice many details when there in person that are not apparent in pictures. some beautiful vignettes! I've heard so much about that IKEA room and I have to say I'm a bit disappointed; I think I expected too much! 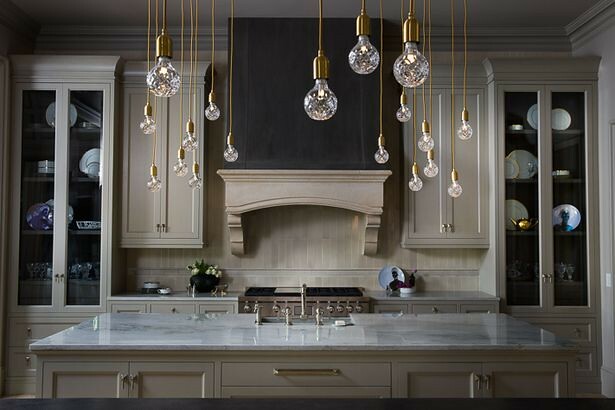 Love some of those light fixtures -perfect for the spaces they are in. 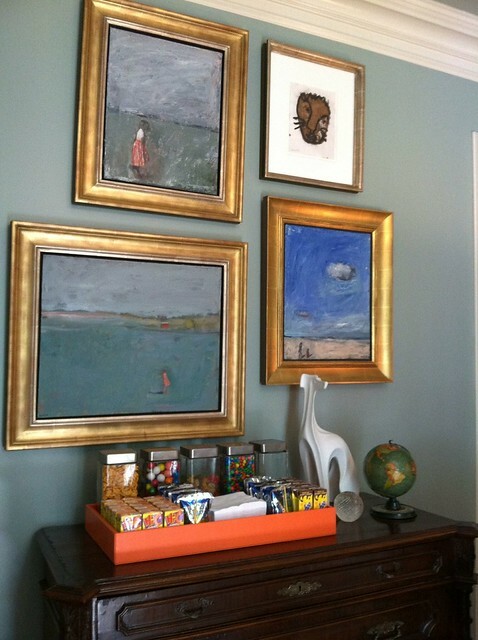 Beautiful vignettes featuring lots of art and accessories! Each one tells a lovely story. My favorite is the wall of bird prints. Thanks for sharing. Have to catch up on your previous posts. 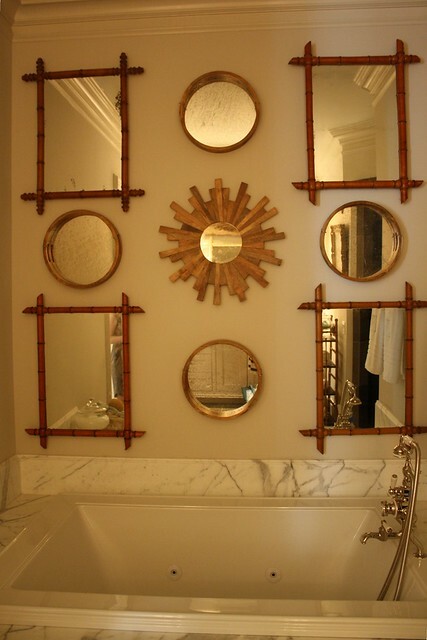 Maggie Griffin and James T. Farmer designed the bathroom with the starburst mirrors! Wonderful details. I especially like the orange panels and creative kitchen lighting! Hi Holly_ Can you please publish the paint wall color list that the show house supplies? I'll be going back this week, I'll see what I can find out! Enjoy seeing the art. Do they list the artists somewhere? Loved getting a tour of this show house! I've been featuring a couple show houses in my area. Fun to see the design differences & similarities from the Southeast to the West Coast!